Wind Chill -15, originally uploaded by [Zakkaliciousness]. The bike lanes on this stretch are wider than normal - about 3 metres - providing ample room for the 25,000 daily cyclists who ride past this point. It's one of the main arteries into the city - Hans Christian Andersen Boulevard. If you have a moment, pop over to JPG Magazine and cast a vote for a photo of mine in their "On the Move" category. 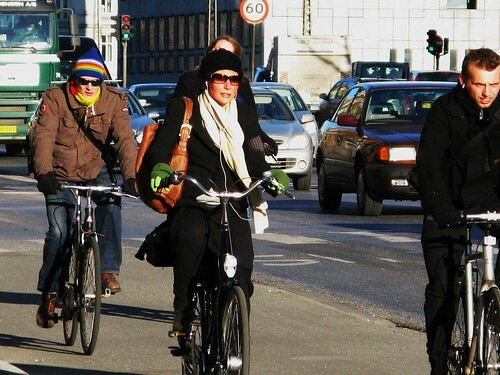 A photo of a Copenhagener on a bike lane, of course, bien sûr. Vote duly cast, mon capitain! I never saw anything most original than your theme. Congrats, I enjoy watching street people! The title of this blog should belong to http://arcticglass.blogspot.com/2008/02/report-from-nikolai.html a blog about a "real" cycle chic racing her bike in the Iditarod Race. 350 miles, sleeping in -30 below temps ... "Wind Chill -30"!